The C7010-3PA-AT is an External 3 FT VHDCI 68 to CEN50 Pin cable, with Active high byte termination in the VHDCI connector. The metal VHDCI connector is "offset" to allow for close placement of a second cable or terminator. 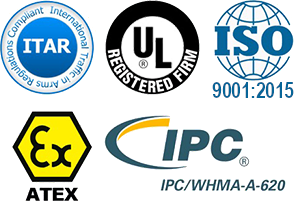 The Active high byte termination ensures proper termination of the lines that are left when transitioning from 68-50 Pins.. 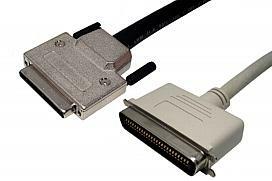 The C7010-6PA-AT is an External 6 FT VHDCI 68 to CEN50 Pin cable, with Active high byte termination in the VHDCI connector. The metal VHDCI connector is "offset" to allow for close placement of a second cable or terminator. The Active high byte termination ensures proper termination of the lines that are left when transitioning from 68-50 Pins.. The C7010-3PBL-OS is an External 3 FT cable with a 68 Pin VHDCI connector on one side, and a CEN50 connector on the other side. The metal VHDCI connector is offset to allow 2 connectors to fit side by side.. The C7010-6PBL-OS is an External 6 FT cable with a 68 Pin VHDCI connector on one side, and a CEN50 connector on the other side. The metal VHDCI connector is offset to allow 2 connectors to fit side by side..